Looking back at the week’s news, I am reminded by Wonkhe that it started with the “B” word. No, not that “B” for a change; I refer of course to ‘Blue Monday’. Regrettably, the other B word, in all its inglorious chaos, continues to feed our January blues. However, it is very reassuring to read how our sector is doing its best to mitigate the possibility of no-deal. While the government gives ‘Plan A’ the once-over to what’s widely anticipated to be a repeat of ‘Plan A’, it was extensively reported, including in iNews, that the universities have brokered their own treaties with institutions across Europe in an attempt to limit the threat of crashing out of the EU without a deal. 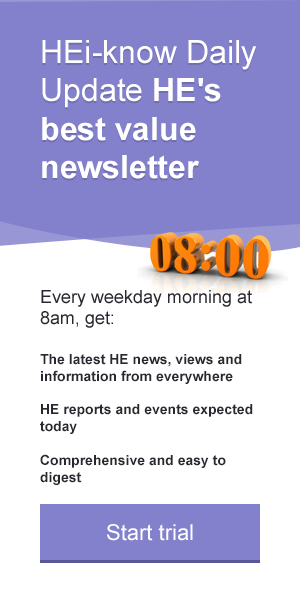 There is a good summary of the sector’s mood in an HE Insight Paper from HEi-know. In our sector alone, it is sobering to think about the human impact, on people and families, staff and students, through this continued and painful uncertainty. I despair at the over-simplistic statements bandied about saying how simple ‘leaving’ can be at any price and at the energy and resources institutions are having to divert to firefight the potential crisis. Where the next turn comes in the Brexit debate is literally anyone’s guess, but for my money I wouldn’t be at all surprised to see May get her plan through as the threat of ‘no deal looms’. This has to be the ‘mamma and pappa’ of all negotiations! The release of OfS’s insight paper, Unconditional offers, Serving the interest of students? hit the airwaves and newswires on Friday. The particular concern about the increase in “conditional unconditional offers” leading to a decline in a student’s achieved grades and lack of motivation to study seems to me to be a legitimate one in terms of “serving the best interest of students”. If I am honest, I am not sure I would have worked quite so hard at my A levels knowing I had a secure place at my university of choice. However, I look forward to the OfS’s consultation on how the admissions system can “best achieve the goal of providing every student with a fulfilling experience of higher education". The answers will not be easy, but I strongly believe in both the autonomy of HE institutions and their commitment and ability to support the student interest without, I sincerely trust, the OfS needing to resort to ‘consumer law’. A sombre piece in the Science & Technology section in The Economist this week under the title of ‘Genetic Disorder’ discusses ‘the reprimand’ of the pioneering biologist and Nobel Laureate, James Watson, for his “unscientific and offensive” views on women in science and particularly on race. The article concludes that Watson’s lifelong desire to provoke “might write a bitter epitaph to an otherwise great scientific career.” Whilst freedom of speech is a defining tenet of academia, happily, the sector is a long, long, way from these indefensible views. In a few days’ time, Advance HE will be announcing the 50th, 51st and 52nd institutional signatories to the Race Equality Charter. We will continue to do all we can in support of institutions in the career and leadership development for women, through our Athena SWAN Charter and supporting programmes. Finally, on a lighter note, the daily dispatch from the same publication concludes with “Music to read The Economist by”, proposing a playlist inspired by the weeks stories: among them, Jacques Brel, the Pet Shops Boys and Asian Dub Foundation. Come on THE, Wonkhe, Media FHE...the gauntlet is thrown, what should we read your articles by!